School Parking: Is it out of control? [vc_row][vc_column][vc_column_text]People share all kinds of things with me, and one thing that is getting a lot of people hot under the collar is what I term #crapparking . The #crapparking hashtag on twitter was set up to try and shame drivers into making better parking choices rather than selfish abandoning which we often see. Parking outside schools is becoming a big issue across the borough. 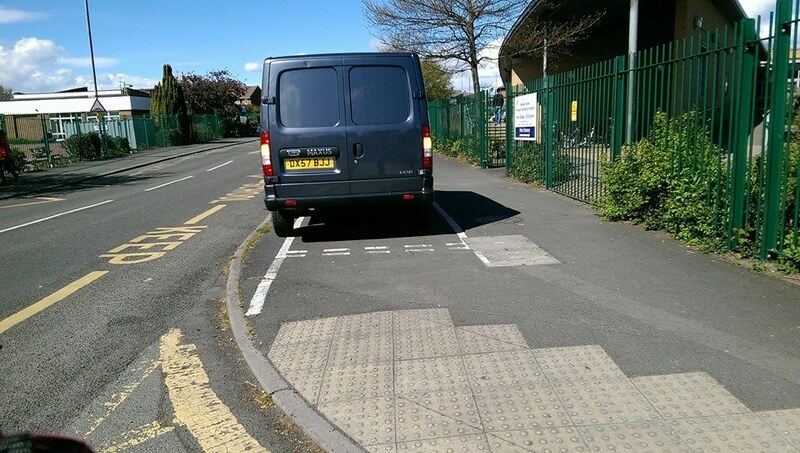 Parents worried for their childs safety are sending me pictures of parents, taxi drivers and the odd copper (yes, a copper) parked on paths, cycleways, zig zag lines and double yellows outside schools. Some guilty parents have even commented on Facebook, with lame excuses such as ‘I broke down’, some even don’t care and one comments ‘my kids are more important’. I’ve even been reported to the police (twice) for sharing these pictures. The vast majority of parents and teachers who comment are simply concerned for the well-being of all the children and parents. Some CSOs are actively patrolling and educating those badly parked. Some even getting letters. Judging by the comments from those approached on Facebook, this is seen as a joke. Rather than threatening, it may be the case that for stopping on Zig-Zag lines, the 3 points are added to licences and £60 fines are the only way to educate. Are the schools doing enough to help & encourage parents find safe places to park? On North Road in Wellington where St Patricks and Wrekin View schools are opposite each other, parking in Morrisons car park at the end of the road is a safe and convenient option. I thought parking on double yellows was an offence. Seems clear course of action or do we have different interpretations of the law for outside schools? If I parked like that in town I would get a ticket and possibly some sort or dangerous parking / driving charge. Park somewhere else and walk to meet your children. Or can the schools come an arrangement with another establishment to use a nearby car park or can they open up the school yard. It’s indicative of parking in general, whether it be inconsiderate or illegal, anecdotally parking appears to have got worse over time, perhaps driven by the increasing volume of vehicles, children going to out-of-area schools, out-of-date infrastructure and what appears to be a lack of enforcement. Name and shame may deter one or two but unless digressions are punished with fines / points then the behaviour simply won’t change,whilst there are always exceptions and special circumstances in the vast majority of cases it is simply a matter of laziness (or personal convenience) , too many drivers expect to be able to park within a few metres of their destination and are prepared to break the law repeatedly to achieve this. The solution is simple, though who pays is up for debate – simply the local authority / police need to enforce the parking laws.